Provide comfort for the family of Philomena Migliore with a meaningful gesture of sympathy. Philomena “Minnie” (Guglietta) Migliore, 94, of Glastonbury, died Feb. 6 at Hartford Hospital surrounded by her loving family. She was the wife of the late Paul J. Migliore. Minnie was born in Hartford on May 16, 1924, daughter of the late Francesco and Amelia (Speranza) Guglietta, immigrants from Lenola, Italy. She grew up in Farmington and graduated from Farmington High School in 1942. 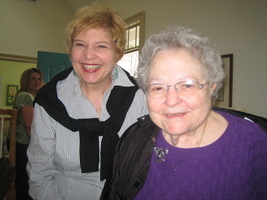 Minnie had fond childhood memories of Farmington, especially walking with her friend, Eva, to grammar school. In September of 1945, she met her husband Paul and they were married at the Church of St. Patrick, Farmington, on Feb. 16, 1946. After their marriage, Minnie and Paul lived on Front Street in Hartford until moving to Goodrich Street in Hartford’s South End in September of 1951. They were married for 46 years until Paul’s passing in July 1992. She and Paul were communicants of the former St. Luke Church on Bolton Street in Hartford. She moved to Naubuc Green senior housing in Glastonbury in 1995 and attended St. Paul Church. Minnie and Paul loved to go dancing and enjoyed playing cards and socializing with their many friends. She was a longtime member of the Angel Collectors Club of America and collected angels from all over the world. The doors of her home were always open to everyone. She was fiercely devoted to her family and her Christmas Eve gatherings with her children, grandchildren, brothers, sisters, nieces and nephews were legendary. Minnie baked Italian cookies that were everyone’s favorite. She was proud of her Italian heritage and loved to hear Italian folk music. In 1975, she made an unforgettable trip to Lenola, Provincia Latina, Italy, where her parents were born. Minnie loved traveling, whether it was a cruise with her husband, a trip to Niagara Falls with her daughter and son-in-law or a visit to Oregon in 2003 to attend her granddaughter’s wedding. She worked for G. Fox & Co. in downtown Hartford and for 20 years in data processing at the Travelers Insurance Company. She retired from Travelers in 1988. She was a member of the Travelers Chorale. She was a devout Roman Catholic. She leaves a daughter Paula Crombie (David) of New Haven; two sons, Frank Migliore (Leola) of Portland, and Donald Migliore (Deborah) of Hartford; five grandchildren Noelle Crombie (Mark) of Portland, Oregon, Tiffney Almeida (Sandro) of Ellington, Stacey Maldonado (Miguel) of Hartford; Anthony Migliore (Nicole) of Portland, Michelle Hetrick (Tyler) of Portland; eight great-grandchildren, Natalie and Emma Maldonado of Hartford, Mallory and Isabella Almeida of Ellington, Sophia, Ella and Nora Halpern of Portland, Oregon and Madison Migliore of Portland; 12 nieces and nephews; and a sister, Cynthia Presmarita of Glastonbury. 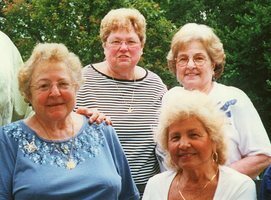 She was predeceased by a sister, Helen Nawrocki, and four brothers, Dominic Guglietta, Valentino Guglietta, Orlando Guglietta and Patrick Guglietta; and sister-in-law Carolyn Morin. The family would like to thank the palliative care team at Hartford Hospital for their compassionate care during Minnie’s stay. A Mass of Christian burial will be offered for the repose of Minnie’s soul at 11 a.m. Tuesday, Feb. 19 at St Paul Church, Glastonbury. Mourners are requested to go directly to the church. She will be laid to rest next to her husband at Mount Saint Benedict Cemetery in Bloomfield. In lieu of flowers, the family requests donations to Make a Wish Connecticut, 126 Monroe Turnpike, Trumbull, Connecticut, 06611. The Farley-Sullivan Funeral Home of Glastonbury is handling arrangements. Carissima Minnie, Che Dio ti benedica. To send flowers in memory of Philomena G. Migliore (Guglietta), please visit our Heartfelt Sympathies Store. We encourage you to share your most beloved memories of Philomena here, so that the family and other loved ones can always see it. You can upload cherished photographs, or share your favorite stories, and can even comment on those shared by others. 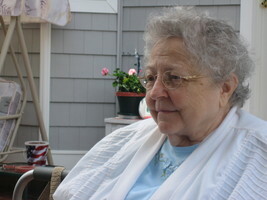 Provide comfort for the family of Philomena G. Migliore (Guglietta) by sending flowers. The heavens are welcoming her with open arms. Very seldom a day when she was not smiling or laughing, infectious to say the least. There was never a time when she didn't offer you with welcomed arms to come to her home and of course to eat! A fantastic cook, which she has passed on to all of us especially Tiffany! My love for Aunt Minnie is and will always be heartfelt and genuine. We will miss you, please hug our lost ones for us.